Recently I was asked by a friend who wanted to learn more about how to use data and tools in their marketing analytics. Here are the key things I told him to get to started with data-driven marketing analytics. 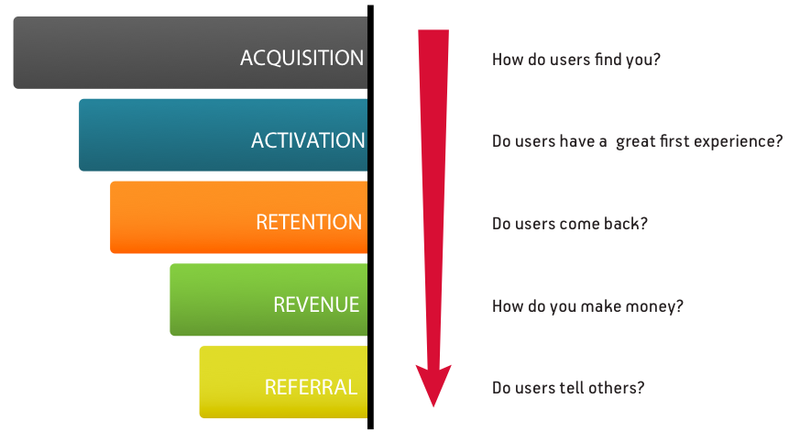 Pirate Metrics was developed by Dave McLure (@davemcclure) as a very simple model, to break down Marketing Analytics into a very simple but powerful model with 5 key stages: Acquistion, Activation, Retention, Revenue and Referral. I wrote a separate Beginners Guide to Pirate Metrics (AARRR!) that's absolutely worth reading. USE A TOOL TO TRACK WEBSITE VISITORS - Google Analytics is great for this. Start with to reports Audience > Overview and Acquisition > Channels. Quickly you'll know how many visitors you have, what you bounce rate is, and what channels are generating traffic. USE A TOOL TO SEND AUTOMATED EMAILS (tailored to individual users) - some great tools include Customer.io, and Intercom.io. If you haven't already done so, install Google Analytics. Almost every professional website uses Google analytics (including 67% of the Fortune 500). It's free and its a great product, especially for tracking upstream analytics (like understanding your best channels or conversions for advertising/adwords/remarketing campaigns). Remember all that Pirate Metric goodness? Now you have an idea what to track - AARRR! you should set up a Marketing Analytics Conversion Funnel now and track it weekly. Don't worry if you don't have all the data yet - you can update as you go forward. The important thing is to start. You "can" set up a basic conversion funnel using a spreadsheet, but you'll get tired maintaining it, so automate your conversion funnel using KISSmetrics, Woopra or mixpanel. Emails are important for customer retention. Automate your lifecycle emails using for example Customer.io, Intercom.io, MailChimp and there are many more. What to look for here are tools that let your trigger emails based on specific and individual customer actions. TIMED EMAILS: DRIP FEED HELPFUL INFORMATION - automate emails to drip-feed helpful information to your new signups on a schedule, for example: 3, 7 and 30 days after sign-up. You'll need to test to find the best cadence for your own unique business, to be able to reach a balance between reaching your customer often enough, without becoming annoying (and forcing them to unsubscribe). TRIGGERED EMAILS: SEND TARGETED EMAILS TO INDIVIDUAL USERS BASED ON SPECIFIC ACTIONS - trigger targeted emails to send to individual users based on specific actions they take on your website/app - such as when they click to download a PDF, add to cart but don't complete checkout, or perform a key action in your SaaS product. Tracking these actions requires a little more effort; you can get your developers to hand write code or you can use a tool to make it easy to track user actions. Here's a great primer on lifecycle emails by Patrick McKenzie. Bonus: an email infrastructure for success. Lincoln Murphy (Sixteen Ventures) put together a details post 5 Rules for SaaS Email Marketing and Transactional Messages that as he says "will lay the foundation for creating an email infrastructure designed for success". BONUS: Popcorn Metrics provides an easy way to send your Customer Data into your Marketing Analytics Stack without depending on your developers. 6. Focus on the One Metric that Matters. Finally, take a look at the awesome Lean Analytics book (by Alistair Croll @acroll and Ben Yoskovitz @byosko). Alistar and Ben are the feng shui masters of marketing data. Central to their thinking is that you should focus on the one metric that matters, and its essential reading for anyone who's serious about data-driven marketing. They break down metrics by different type of business (ecommerce, two-sided market, SaaS, mobile app, and user generated content, and media businesses). Alistair and Ben recommend you focus on a small number of key metrics (the metrics may change over time) as opposed to tracking everything and being swamped by having too much data. NOTE: This doesn't mean you shouldn't capture lots of data, but at any give time you should only focus on some key aspects and let that drive your decision making. Having the extra data allows you then to dig deeper when you need to. Get the Lean Analytics Book and read it - it's a no brainer. Ok, so there you have it - the essentials for a simple marketing analytics stack. Use Pirate Metrics (AARRR) to give you a structure for your Marketing Analytics. Setup a basic Marketing Analytics Stack. Look at your traffic, channels and conversions. Send automated time based and action based emails. Start tracking weekly, stick to Lean Analytics and focus on a small number of key metrics. Naturally, you'll want to set up your own marketing analytics stack, so here are some tips on how to get started setting up a Marketing Analytics Stack, and what shortcuts to take. BONUS: Popcorn Metrics provides an easy way to send your Customer Data into your Marketing Analytics Stack. What tips or challenges do you have with your marketing analytics stack? - leave your comments below.